Placemaking—the idea that spaces aren’t things people pass by but, rather, things they use and experience—is an art form. And when it comes to Long Beach, it has long struggled in creating long-lasting public, open spaces that people enjoy, having only experienced recent success with spaces like the Promenade in DTLB and the bluff at Bixby Park. Arts and public advocates hope to change that with the East Village Arts Park, a pocket park off the south side of Broadway hidden along Elm Ave., with what they’re calling a “re-opening” on June 26 at 6PM after years of patchy activation—and they hope to do so by streamlining the event-planning process for the park and partnering with DTLB-centric organizations to activate the space more frequently. 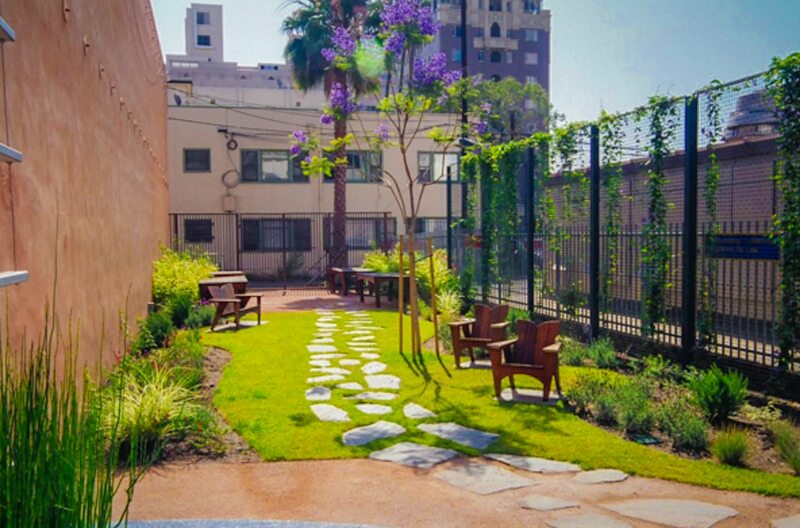 Long Beach has a cultural, spatial obsession with pocket parks—think Miracle on 4th Street Park in Alamitos Beach or Harvey Milk Park in DTLB, each of which have had or are getting much needed upgrades—and this particular pocket park is one that is widely ignored but awesome. Its Nightmare Before Christmas-like metal gate welcomes people into a thin stretch of grass, great landscaping, and views of DTLB that make you feel like you’ve entered the world behind the wardrobe. This isn’t to say that it has been entirely abandoned; throughout the years, a handful of permits have been pulled to use the park—the Downtown Long Beach Alliance (DLBA)’s use of the park for its Live After 5 music series is one of the more recent examples, which would explain the fact that the BID has continued to carry the insurance to host events nightly until 9PM. But the underpinned point is that it remains vastly underused, hence the hopes that this re-opening will inspire locals and visitors alike to use the space while also creating activation within it via events, arts activities, and leisure. The kick-off event on June 26 set to revamp usage of the park will be hosted by the Long Beach Art Council and involve a face-to-face conversation between leaders, residents, and stakeholders who will be asked to share what they hope for the space. (Highlight: live music will be performed thanks to the talents at Pow! Wow!’s School of Music). Following this conversation, the public will be encouraged to request permits for events as they will be directed to and through the Arts Council, who will maintain on online calendar for programing. The East Village Arts Park is located at 150 Elm Ave. in DTLB.